Thursdays 9-1 p.m. and 3-5 p.m.
2nd Friday of each month 6-8 p.m.
LAST Saturday each month - 1-4 p.m.
FREE to the public; a chance to come out and socialize with your family and friends. Bring your own projects from home, or try your hand at what's being offered for the evening. We always offer something on a beginners level, but you're free to modify it as you'd like while you're "Exercising your Creativity"! your child who is 10 yrs old or older. donation of $5 per child for 2 hours/$15 per 6 hr day, per child. "Kinda like this, but NOT"
You may recall this piece from a class we did last year. Guess what: We aren't doing THIS exact same painting!! 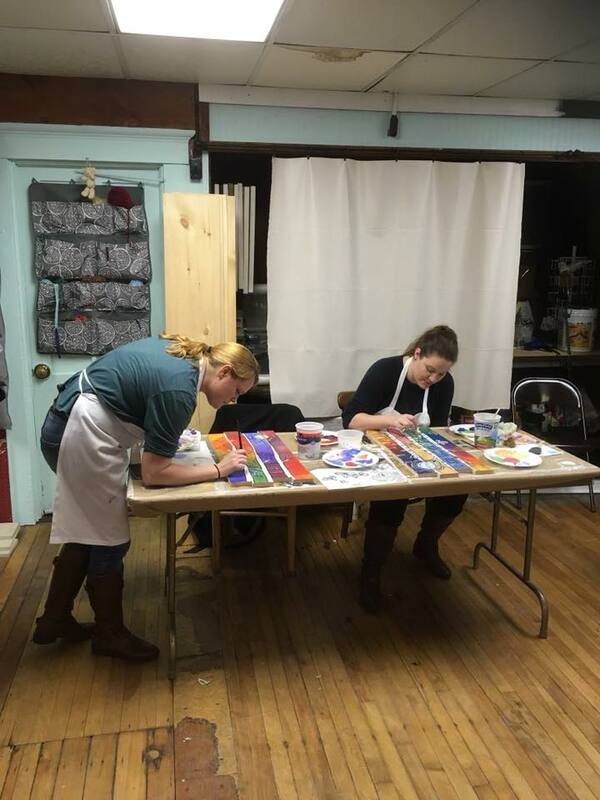 It will be somewhat different for sure, because we are going to explore the abstract world and paint with almost ANYTHING BUT A BRUSH in this workshop. We'll be gathering up a lot of things to paint with - and if want to, you can bring your own tools you've used to create texture or design elements. Wear junky clothes - we have aprons, but this will be a messy art and play experience. Please don't come with expectations of perfection, and being "precious" as my friend Amy Smith would say - with your supplies. We are going to JAM with paint and loud music! You know you have one (or more) unfinished projects that you've been "meaning to get to". Well now's the time to grab that great tote bag of yours, stuff that project in there, and bring it to the Art Gym for a Saturday and work on it with friends, new and old! Things go better with a little fellowship, so mark your calendar, call your besties, and come on down.